If you’re on the lookout for Implantable Contact Lenses which are both practical and durable enough to withstand the rigours of your travels this summer, then you needn’t look any further than AVC. 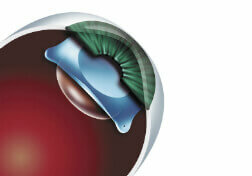 EVO Visian ICL is now available exclusively from the world leading clinic: Advanced Vision Care. Visian ICL has a well-earned reputation for both reliability and safety, gaining FDA approval since 2005. They have undergone clinical trials to achieve high standards in vision correction. That’s why it’s well worth having an eye consultation at Advanced Vision Care to find your suitability for an Implantable Contact Lens implant. We know from experience that Visian ICL is trusted by many refractive surgeons the world over and with good reason. Visian ICL is every bit as high quality as you would expect from a world leading manufacturer of lenses and that’s why it has proved such a success worldwide. “It is certainly a great time to get your implantable contact lenses and get rid of your prescription glasses and lenses for the busy summer season, when millions of people will be heading off to holiday destinations at home and abroad” he added. ICL vision correction surgery is a reversible procedure, very often chosen over laser vision correction treatments as there is no permanent modification of the cornea. ICL can correct prescriptions up to: -24 DS (short sight) +12 DS (long sight) -7 DC (astigmatism). Military organisations the world over have been regularly implanting Visian ICLs into their service personnel’s eyes because of their superior sturdiness and long lasting vision correction. Available exclusively at Advanced Vision Care, studies have shown excellent vision quality and stability of the lens inside the eye even in combat situations. ICLs have also been shown to be an effective, safe, predictable and stable way to correct high and low levels of short-sighted (myopia), long-sighted (hyperopia) and astigmatism.